We ask that you call us at 508.693.4429 or email Claire or Sue to purchase a print (We'll be available by phone, In-season: Mon-Sat 10-5, Sun 1-5; Off-season: Mon-Fri 9:30-4). We'll help you choose the image, size, and frame color (or matted only), and discuss shipping options with you. There are lots of variables, and all of our prints are custom-produced for each order. By talking with you, or emailing back and forth, we can ensure that you will get exactly what you want. If you're looking on this site during off hours, all of the images under the "Portfolio" section are available as fine art prints. To find sizes and prices, there's a link under each image that says "Click here for print specifications." When you click the link, a chart will pop up, which has the basic size and price information for that image. We have a number of prints in stock, but most print purchases are custom orders that take from 1-3 weeks, depending on the type of print and whether it'll be framed. Pigment prints normally take 1 week, and canvas prints (and the largest pigment prints) take up to 3 weeks. We use UPS for shipping, which we'll charge separately to your credit card. Alison's color work is printed as Pigment Prints, using archival pigmented inks on high-quality heavy watercolor paper. This process is considered to produce the most stable color prints. All color prints are signed and titled by Alison, then mounted and matted with bright white 8-ply archival matboard. We do most of our own printing in our studio above the gallery. Our studio manager, Claire, does the printing, overseen by Alison. Prints can be purchased matted only, matted and framed, or printed on canvas. Most of our black and white prints are still done as archival, selenium-toned, fiber-based Silver Gelatin Prints, which are done in the darkroom by master printer Paul Sneyd, at Panoptican Imaging in Rockland, Massachusetts. We love the beautiful richness and finish of these museum-quality prints. If you are interested in a very large black and white print, we will have it done as a pigment print by Hunter Editions. Many of the images can be printed on canvas. 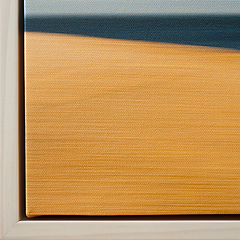 Often customers see Alison’s abstract work as paintings, and the canvas accentuates that feeling. We do a “gallery wrap,” with the image continuing around the edges. We also offer a floater frame if desired. The canvas prints are done using the same process as our color prints, but a matte coating is added. 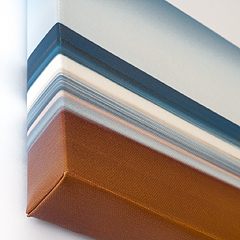 They’re light, easy to hang, and non-reflective, so canvas is ideal for larger prints. We’ve chosen to not make canvasses limited editions, so that we can customize them for each customer (they’re priced by the square inch). The largest canvas we’ve printed measures 13 feet wide by 4 feet high, and the smallest measures 10” square. Our mats are all cut from archival bright white board – for small black and white images we use a 4-ply board, and for all other images we use an 8-ply board. For all of our color prints, as well as the larger black and white prints, we offer a simple, square-edge wood frame painted black or white. 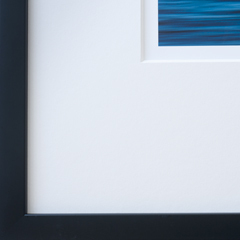 For our 5x7” and 11x14” framed black and white prints we use a square-edge simple matte black Neilson metal frame. We use regular picture-framing glass, but can do plexiglass, UV glass, or museum glass for an additional fee. We also offer a premium framing option that's standard on our R4 and S4 sizes, and available for an additional charge on all other sizes. For our canvas prints, we offer a premium floater frame as well. A pigment print is a digital archival print. They are printed using pigment-based inks as opposed to the dye-based inks found in most inkjet printers. The main reason for using pigment inks is their longevity and color stability. According to testing done by Wilhelm Imaging Research, pigment prints generally last 50-100 years under normal display conditions, and can last up to 200 years under museum storage conditions. Nearly all of Alison’s color prints are done as limited editions. These editions run in size from 20 to 150 prints. As an image goes higher in edition number and therefore closer to running out, there is a corresponding increase in price. When an image has gone up in price in a particular size, this will be noted under the caption for the image, with the higher price noted as well. What kind of printer, ink, and paper do you use? Our prints are done on an Epson 7800, which uses Epson UltraChrome pigment-based inks. We use two varieties of paper, depending on the nature of the image. Epson Hot Press Natural is a smooth white matte finish paper. Hahnemuhle William Turner 310 is a textured, bright white watercolor paper. What are the advantages of printing on canvas? With larger prints, we prefer canvas to framed prints. Canvasses are non-reflective, lightweight, easy to hang, and beautiful. When we hang a large print on the main wall in our gallery, it is always a canvas – the reflections in the glass of framed prints is too distracting. Also, with canvas we can customize sizes to suit your needs. Rather than needing to work within the limited edition sizes of our framed prints, we will print to your specifications, creating a canvas just for you, at the size you want. When is it preferable to buy a print matted-only? 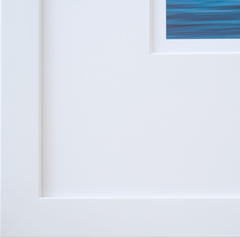 If our frames do not work well with the particular image, or with your decor, you may want to purchase the print matted-only and have it framed at a frame shop where you will have many more choices. Or, if you are interested in a large print which will need to be shipped to you, we prefer that you purchase the print matted only – this will reduce your shipping costs significantly and will also eliminate the possibility of any breakage of glass.